Mergers between mining and also exploration companies have developed market appeal in Australia and one of the new proposals involves chief executives with strong New Zealand links. Dual listed MOD Resources Ltd (ASX & LSE: MOD), earlier this week went into a trading halt to announce a significant capital raising and also that the company had received a takeover bid approach from successful Western Australian copper-gold miner Sandfire Resources Ltd (ASX: SFR). MOD is run by New Zealand educated geologist Julian Hanna who took over running that company several years ago after stepping down as managing director of one of Australia’s most successful nickel miners Western Areas Ltd (ASX: WSA). At the time of joining MOD, the company was advancing exploration on the Sams Creek gold project near Takaka on NZ’s South Island and previous management had set in motion the sale of the company’s Kalahari copper belt prospects in Botswana. At the time, the share market was not supporting junior explorers and the expensive exploration at Sams Creek – where MOD had earned 80% equity from OceanaGold Corporation (TSX & ASX: OGC) – had seen the resource increased to more than one million ounces of gold. Hanna was forced to put Sams Creek on ice and with the potential he saw for new copper-silver deposits in Botswana, he increased the tempo there and struck a joint venture to expand activity. Last year MOD gained market attraction from a capital reconstruction and the discovery of major new targets including the T3 deposit, and late in the year MOD gained listing on the London Stock Exchange. Sandfire is one of Australia’s modern success stories through high grade copper-gold mining at DeGrussa in WA’s mid north. It is run by Karl Simich who was an executive director and secretary to Macraes Mining, the original company that began mining at Macraes. Three years ago Simich gave a presentation on Sandfire at the AusIMM NZ Mining Conference in Wellington. Early this week MOD announced it had raised $A10 million through an institutional placement and there was to be a further $A5 M fully underwritten rights issue to existing shareholders. The majority of funds are intended for working capital to advance the T3 copper project towards production and defining additional resources within the surrounding area. It had received an unsolicited, non-binding, proposal for Sandfire to acquire 100% of the company as an all-scrip transaction at an equivalent price of A38 cents per MOD Share. The media was reporting varying figures for the takeover bid with the AP newswire citing a total figure of $A94.5 M while a newspaper put it as high as $A130 M.
A subsequent report from MOD said its directors had viewed the Sandfire offer and considered it inadequate. The company said it had completed purchase of the farm on which the T3 deposit was located. Meanwhile, off the radar is the future of Sams Creek, which MOD and OceanaGold still retain and which last year was proposed for the planned ASX listing Condamine Resources, a deal that lapsed when Condamine failed to get its IPO going. 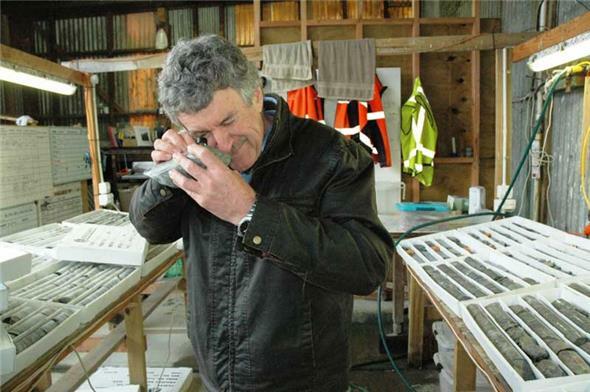 Condamine subsequently took up a series of historic leases in the Reefton goldfield and earlier this month gained support for its listing from ASX junior Blina Minerals Ltd (ASX: BDI) which is awash with shares (4.36 billion shares and 905 million options, expiring next year at A17¢/share; with a current share price of 0.1¢). Julian Hanna checking drill core at MOD’s core farm at Takaka in 2013. Karl Simich presenting at the AusIMM NZ Mining Conference at Te Papa in 2016.